Why the Arab Spring Never Came to the U.A.E. Conspicuous consumption and glittering glass towers sprouting from the desert sands of Dubai and Abu Dhabi are only part of the story in the United Arab Emirates. Another part is far darker and less shiny. Exhibit A: the case of five activists whose call for greater political rights has been deemed a national-security threat, and earned them charges of "publicly insulting" the federation's rulers. The five men  bloggers and activists  were detained in April, just a month after signing and circulating an online petition endorsed by 130 other prominent Emiratis. The petition called on the country's President to expand the powers of the Federal National Council (FNC)  a quasi parliament serving in an advisory but not legislative capacity  and to allow all citizens to vote for its members. "Participation in decisionmaking is considered a part of the traditions and culture of this nation since before the founding of the state and after it, and we are all eager for its continuation," the activists said in the petition, whose signatories included former government officials, journalists and academics. It was the first ripple to reach the U.A.E. from the wave of discontent sweeping the Middle East. The only change the U.A.E. 's ruling sheikhs are hoping to see is in their cities' ever evolving skylines. Still, they have made small concessions. The government increased the number of handpicked voters to elect 20 of the 40 members of the FNC, from some 6,500 to 129,000 (15% of the citizenry) this year. The rulers name the other half of the assembly. The small electorate wasn't exactly electrified by the change, if the 28% turnout in the Sept. 24 election is any indication. Ibtisam al-Ketbi, professor of political science at the United Arab Emirates University, says the low turnout was the result of a lack of awareness among an electorate for whom voting would be a novel experience, a short campaign season (three weeks), and the fact that some people might not have wanted to vote for "an institution which has no power." Among the key issues facing the U.A.E. 's rulers is the imbalance in distribution of the federation's vast wealth. The U.A.E. has one of the world's highest gross domestic products per capita, at over $47,000. But drive a few hours north of glittering Dubai, in Ras al-Khaimah, Umm al-Quwain or Fujairah, and the differences are stark. 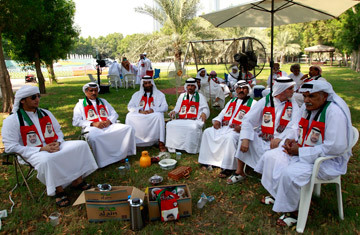 "The streets are not in perfect shape, there are holes, and people are poorer than other Emiratis. The system as a whole is not as developed, as professional," says Fatema Hadroom, 37, one of the few women who ran for office but failed to secure a seat. (Only one woman was elected, in Umm al-Quwain). In March, the federal government announced a $1.6 billion program to improve water and electricity networks in these poorer northern regions, and $1.9 billion was earmarked for housing loans after Abu Dhabi's Crown Prince Mohammed bin Zayed al-Nahyan called for measures to shore up "social stability" following a tour of the northern emirates where there have been occasional signs of social protest in past years. In many ways, the U.A.E. epitomizes the long-standing but now crumbling Arab social order in which autocratic leaders promise security and a measure of prosperity in exchange for quiescence  an arrangement decried as a social bribe by one of the five accused activists, Nasser bin Ghaith, a lecturer at the Abu Dhabi branch of Paris' Sorbonne University. "They have announced 'benefits and handouts' assuming their citizens are not like other Arabs or other human beings, who see freedom as a need no less significant than other physical needs," bin Ghaith wrote in a blog post before his arrest. The case of bin Ghaith and his fellow activists shows that the price of dissent is high. Their case has elicited harsh criticism from Amnesty International, Human Rights Watch (HRW) and other groups, which in a joint statement branded the trial as "fundamentally unfair" and riddled with procedural flaws. "Pretty much every due process issue you could imagine" has been violated, says Jennie Pasquarella, a civil-liberties lawyer from Los Angeles in the U.A.E. to monitor the trial, of which first four sessions were held in secret. See how Wall Street's bust threatens Dubai's boom.